Nokia is making waves in the handset market in rural China, targeted as their next big emerging market. If their success is sustained, it will become a case study in the annals of how a multinational can create an entirely new marketfor itself in a highly competitive and challenging environment, home turf of the ‘cheap Chinese imports’ themselves. With 40% marketshare globally and the alternate name for ‘mobile phone’ in India, Nokia has few untapped markets left. This will be one foray worth watching. Next, they’ve been in the field listening to voice of their rural audience. They’ve revamped product design and distribution – critical issues when entering a new market that is socially and economically, as well as culturally, very different from your own. Of course, we know Nokia has embraced being human-centered and does not stint on ethnographic and design research in the field. Nor do departments other than design ignore the information gathered from the field. Nokia had planned an aggressive price reduction plan to combat the loss but the idea was scrapped after Giles happened to be visiting Chengdu in Sichuan province. During the four-day trip, he visited a mobile phone street (most Chinese cities have at least one mobile phone street packed with cellphone vendors) and talked to many there, including operators, distributors, shop clerks, sales people and merchandizing people. He discovered that Nokia’s rigid distribution strategy prevented consumers from getting its products. “I had agreed with my boss, who was based in Singapore at the time, to make some changes in our pricing and make our pricing strategy a bit more aggressive,” he recalls. After that, Nokia has started to revamp its distribution channel by reducing the number of national distributors while increasing the domestic, or provincial, distributors. It also hired third-party sales representatives and opened its own-branded shops. 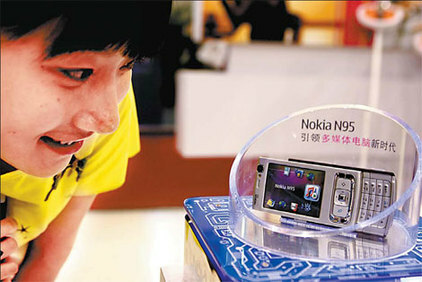 This year alone Nokia has increased the number of its distribution outlets in China by about 20 percent. There are now about 48,000 locations in hundreds of cities around China where Nokia phones are available. Motorola’s sales network comprises about 30,000 shops. Distribution in China is hampered by the large size of the country, and by the uneven levels of development in different areas. Nokia has received unexpected help from enterprise-minded Chinese. In ascertaining its own distribution channels, Nokia noticed that in more remote towns, merchants themselves have sought to expand their operations. “They packed telephones in their backpacks, hopped on a bus, and went to sell in smaller towns. This brought new distribution channels that we were not involved in”, Giles says. they’ve just announced their latest marketshare, its 41.02% of the Chinese market reports Xinhua just a week ago. The mobile internet, of course. This entry was posted in Business, Culture & research, Design, India/Asia/China, Marketing, Mobile platform, pay as you go economy, Strategy and tagged china, mobile, nokia. Bookmark the permalink.